The veggie quesadilla pretty much only had corn, black beans, and raw white onions (RAW... no one wants onion breath). The worst part was that the "salsa" that comes with it was canned tomato sauce. I asked for extra salsa at first and he gave me the guacamole instead for free, which was nice. But he had originally tried to get me to buy it for $1 and it was a teaspoon of watery guacamole. Do some more authentic Mexican food and maybe you will have better luck. After taking extra time to walk a few blocks to get to the food trucks, I decided to take a chance and try a different food truck . I ordered a chicken burrito. After walking back to my office to eat, I noticed a long black curly hair in my food. I was so disgusted that I couldn’t even eat the food. I had to spend an extra $8 bucks on a sandwich for lunch. I’m very disappointed. I tried to call the number from my receipt and there was no answer. They gave me tacos with rotten lettuce. I was already back in my office before I noticed it. That is not what I call FRESH!! Chicken tacos were really good! Customer was great and friendly. I only waited about 3mins for my fresh tacos. A little heavy on the sour cream, but the tacos were overall great if your looking for something that's not burn your mouth spicy. Wish they would offer hard shell! Food was okay. A little bit expensive, and it took 8 minutes to make my food. The quesadillas didn't didn't have all the toppings it said it had. Steak burrito was flavorless and boring. No hot sauce options. Apr 11, 2014 by Joy B.
Rotten lettuce (had red stains on the lettuce), too much sour cream - no flavor, and my chicken tacos had beef in them too (I didn't order beef). 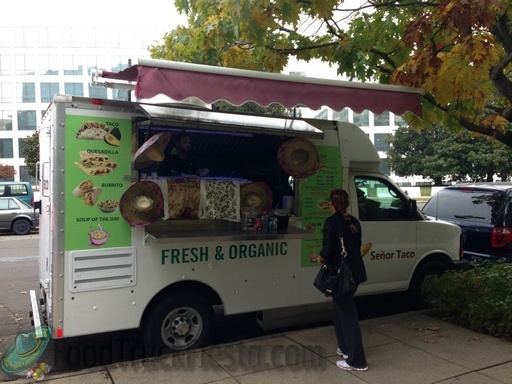 Señor Taco food truck serves Mexican cuisine.